Hello, loves! Today’s Daily Find comes from the lovely shop known as Good Marvin. If you need something blue (in sapphire blue, to be exact) with just the perfect amount of lace… we’ve found it! 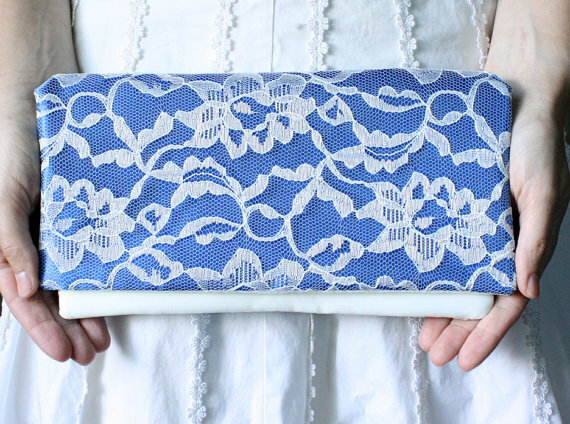 This Something Blue Lace Clutch is handmade in floral lace and satin with a 100% white cotton interior. There’s even a layer of eco felt sewn in to the layers to provide padding. Each clutch is handmade and this particular style is idea for the bride-to-be. Consider similar clutches (in a variety of shades) for your bridesmaids to carry down the aisle! Find out more about this clutch (+ view more clutches and accessories!) at Good Marvin.